Thank you @Of Beauty and Nothingness: "Skintifique skincare"
This week, we have the pleasure to share the article that Heather from the blog Of Beauty And Nothingness, wrote about the Cleanser P and the Moisturising Lotion HP. Here is what she thinks of these two products. 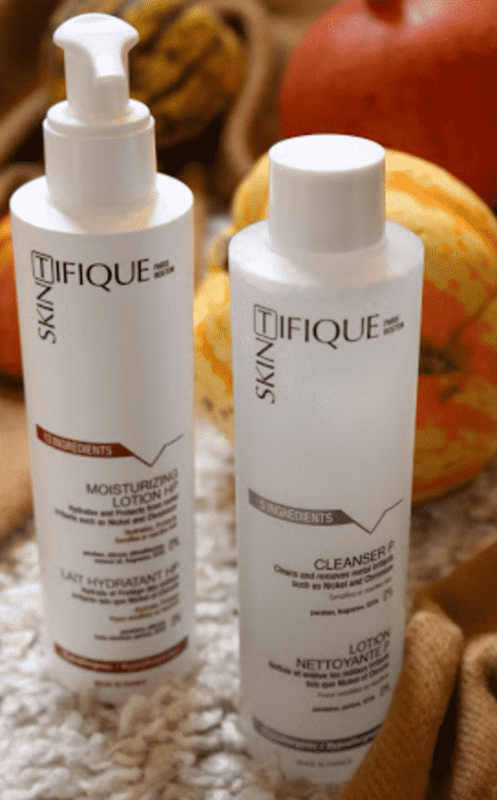 Skintifique is a French/American skincare brand that focuses on effective products for individuals with reactive or sensitive skin and skin conditions such as eczema. So as I have facial and body eczema, I was excited to give it a go! The cleanser is a pure micellar water that cleanses and removes makeup, pollution and provides instant comfort. It also only contains five ingredients. The micellar water looks and feels like all of the other micellar waters I’ve tried (and I’ve tried a lot!). It doesn’t irritate my skin which a couple of micellar waters have done. Micellar waters are fantastic, quick and easy cleansers for effective and fuss free makeup removal and this one is no different. It leaves my skin clean, makeup free and while it doesn’t remove it quite as well as Bioderma, it’s still fantastic! Overall rating: ★★★★★, 5/5. Moisturisers are such an important product in my skincare routine as my skin is dry and when I have an eczema flareup. It’s becomes incredibly dry so it needs all of the moisture it can get. As well as around my eyes, I also have eczema on my hands which obviously in the colder months becomes much worse and very uncomfortable. I’ve been using this moisturiser on my hands almost every evening with my moisturising cotton gloves and it definitely been helping to keep my skin smooth, soft and moisturised. I don’t use it that much during the day as it is a little heavy and slower to absorb than my other hand creams. It doesn’t irritate my skin at all, it leaves my skin comfortable and smooth! Overall rating: ★★★★☆, 4/5. Thank you @Of Beauty And Nothingness for this article! Intense and long-lasting moisturising and soothing. Protects skin from environmental stressors which can trigger eczema outbreaks. Proven efficacy. Very safe & pure formulations. Very pure moisturising lotion which hydrates and protects skin from environmental stressors (pollution, dryness, metals…) that can irritate and help trigger eczema outbreaks. This cream provides an intense and long-lasting moisturising, soothes and helps repair skin which is irritated by eczema. Very pure & safe formulation. What are the results of Skintifique products on eczema? Below are photos of a woman suffering from eczema on both hands due to a Nickel allergy. After using the Protective Cream HPS to protect her skin against contact with Nickel, the Moisturising Lotion HP to moisturise her skin by day, and the Hydrating Gel Plus HS to repair her skin by night, a very clear improvement can be seen. I tested the Protective Cream HPS. It was the Doctor Badulici who advised me to try it. I apply it directly on my skin before touching an object containing Nickel or Chromium. And I can confirm that it is very efficient! With only one application, I am protected for at least 12 hours. I tested it on my earlobes before wearing costume earrings (which cause every time redness and itching). And it was … a miracle. This cream, applied locally, creates a protection against this kind of irritant metals. No reaction, no pain: it’s a revolution for my skin. For me, it is a totally effective treatment! I put this cream after my face lotion and my primer. It protects from metal irritants such as Nickel and Chromium. I put this under my makeup. The cleanser removes the black marks that costume jewellery creates on my skin, and I use the protective cream to apply on my ears, wrists and fingers before wearing costume jewellery. Next PostIs Nickel allergy hereditary?